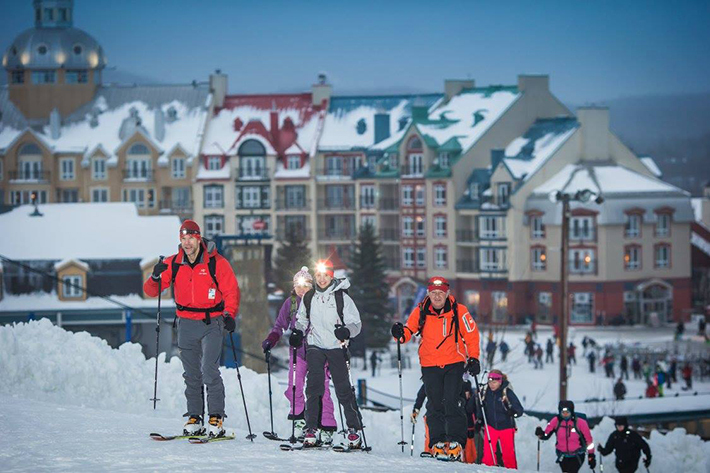 To discover the mountain in a new way: that’s the objective of Tremblant’s Festival Rando Alpine! During the weekend of January 8 to 10, 2016, participants lived memorable experiences and were left with new stories to tell. The event kicked off Friday night with a guided fatbike outing. With the urge to discover new ways to enjoy winter, 43 participants, divided into four groups, explored the snow covered bike trails along the Diable River. The trails, groomed by Vélo Mont-Tremblant offer a unique adventure for cyclists of all levels as well as a new kind of winter challenge. Later that evening, the festival-goers were invited to a friendly Happy hour, hosted by Fat Mardi’s. Saturday offered a nice pleasant day for a mountain climb. Twenty-seven courageous early birds left at 6 a.m. to take on the Ascension au Soleil Levant, the first of seven outings in the Festival’s second edition. One of the most popular outings of the day was the Forest adventure that had skiers scale the Sentier des Pruches, ski down La Carriole, climb the Nord-Sud followed by the Grand Nord and the Timber, finishing with a descent on the ski slopes to the south base. Both Introductory tours taught a total of 55 adventurers how to use the sport’s technical equipment. Guides also offered a few basic tips on climbing techniques, including advice on clothing, nutrition, movement, etc. On the other hand, 47 experts, in search of a challenge, participated in La Course du Festival, sanctioned by Skimo East. This race, which included sections of climbing with skins, boot-pack and descent, was the first Skimo East race of the 2016 season. The festival’s first edition favourite, La Traversée nocturne, gathered more than 207 people in several groups. Although dispersed during the ascent the participants found their way to the top for snacks around the fire pit. After a pleasant, although slightly foggy descent, a festive mood accompanied the fondue dinner held at the Fourchette du Diable. The evening continued with a presentation by Simon St-Arnaud, the Alpine Adventurer, and many prizes were handed out. Sunday’s activities were slightly spoiled by Mother Nature dropping several millimeters of rain on us. Which is why we wish to commend the courage of the six skiers who nevertheless finished Le Tour de la Montagne in the rain! Throughout the weekend, the main manufacturers of the alpine touring industry, as well as ski and avalanche specialists, presented the industries innovations in ski boots, accessories and security essentials. Finally, despite the disappointing weather the last day, the 2nd edition of the Festival Rando Alpine Tremblant was a success. Several curious new comers discovered this increasingly popular sport and all participants left happy, with sound advice and great memories!